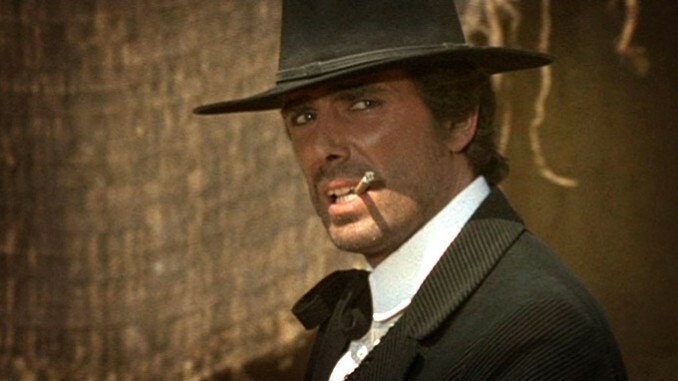 This entry saw Hilton take over from Gianni Garko as the titular character in the popular Sartana series. There is a corresponding change in atmosphere too, with the gothic machismo of the earlier four entries giving way to a preponderance of the type of humour that permeates virtually all of Giuliano Carmineo’s collaborations with his favourite actor. For a plot we are given the regulation ‘lots of people seek to con each other out of a large amount of gold’ scenario. The main participants – apart from Sartana himself, of course – include a corrupt banker (Piero Lulli), a crazed Mexican bandito (the always-excellent Nello Pazzafini) and a pair of ludicrous low-rent psycho brothers (a dream-team pairing of Rick Boyd and Luciano Rossi). There’s also an extremely camp fellow called Sabbath (Charles Southwood) gadding around in a lovely white costume, daintily drinking tea and talking about his mother! The style is pure comic book, with slyly malicious direction combining with superb photography, fine music and eccentric set pieces. 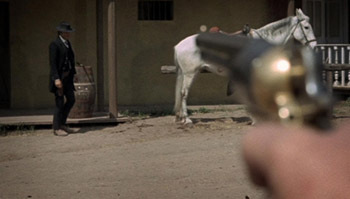 There are jokes aplenty (such as Nello Pazzafini shooting the petals off a sunflower one by one whilst repeatedly proclaiming “I am faster than Sartana…He is faster than me…”), but they fortunately don’t intrude on the plot that much. For some reason this really reminded me of Sam Raimi’s excellent Sharon Stone vehicle The Quick and the Dead (95). Don’t ask me why, though.